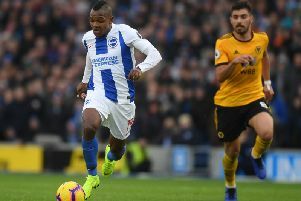 Brighton set their second Premier League record of the season in last night's 3-1 victory over arch rivals Crystal Palace. In the 26 years of the Premier League, it was the first time two substitutes had scored in the first half of a game. Earlier this season Albion stars Murray and Bruno set a new Premier League record when they combined for the Seagulls' goal in the 1-0 win against Wolverhampton Wanderers. With Murray 35 years and 32 days and Bruno 38 years and 25 days, their combined age was 73 years and 57 days. They beat the combined record of 72 years and 168 days when Paul Scholes (35y 273d) set up Ryan Giggs (36y 260d) to score for Manchester United against Newcastle in August, 2010.